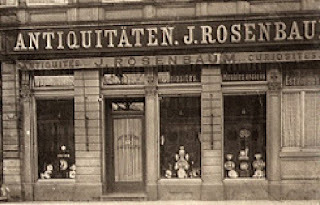 My family firm was founded in Frankfurt-am-Main by my great uncle Isaac Rosenbaum some time previous to 1870. They did not deal in old master paintings until the turn of the century and not in French furniture until the 1920’s so what did they do? They dealt in what the Germans called klein kunst, literally small works of art, which meant at the time, renaissance bronzes, medieval objects and ceramics. In Germany the greatest interest then was in the Saxon royal porcelain factory of Meissen but other porcelain and faience were also of interest. I have a book bound in maroon leather with gold lettering kept by my family recording the purchases made by a single family of Meissen porcelain, other German ceramic factories as well as a few other types of klein kunst. 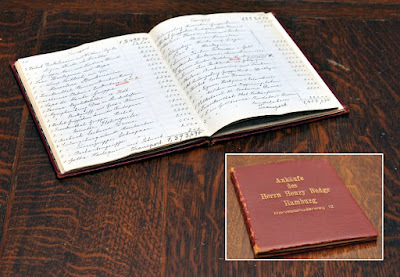 The book consists of 51 hand written pages and dates from 1904 to 1917. Obviously taste and fashion change and different areas of collecting are interesting to different collectors in different times. In various times the most expensive German porcelain on the market were 18th century figurines. One dowager, Emma Sheafer, had led a German museum to believe that they would receive her collection of Nymphenburg figurines when she died. So they collected around the pieces she had. Unfortunately for them, Mrs. Sheafer decided to bequeath her entire collection of paintings, German furniture and the figurines to the Metropolitan Museum in New York. Though German by birth she had left at the time of the Nazis and lived the rest of her life in New York. I am sure that the fact that one of the curators at the Metropolitan had paid court to her in her later years played a significant role in her decision. Be that as it may, he had never expected his museum to actually receive the collection! In the 1960’s Meissen birds were the rage in the United Sates, so much so that at one time the Metropolitan Museum received three different collections of Meissen birds. Naturally there were some duplications and in the process of cataloging a variety of states of condition were discovered. One of the donors was known to always look for the bargain and it has always amused me to know that one of his birds had a wooden tail and a wooden leg. I am sure the dealer sold it cheap due to these old repairs. The bird was de-accessioned by the museum in favor of an example in fine condition from another donor. Today there are still passionate collectors who stand apart from the general declining interest in decorating with European porcelains. One is Henry Arnhold whose collection of Meissen was the subject of recent exhibitions at the Bard Graduate Center and at the Frick Collection, with a scholarly catalog by Maureen Cassidy-Geiger, including an excellent article by Sebastian Kuhn on collecting German 18th century porcelain. Another is a client of mine who is interested in a Meissen service made for his ancestors bearing the family’s coat of arms. He is involved in his pursuit of these pieces with a passion for what Thomas Hoving, a former director of the Metropolitan museum called, “The Chase and the Capture”. Each collector has different goals and aspirations. The tide of fashion waxes and wanes but there will always be those who appreciate and want to own examples of the artistic accomplishments of history, be they large in scale or “klein kunst”. Why go to an Art Dealer?